The Fluidwell D013 is a versatile, waterproof DIN panel mount flow rate indicator and totaliser with continuous flow rate monitoring feature. 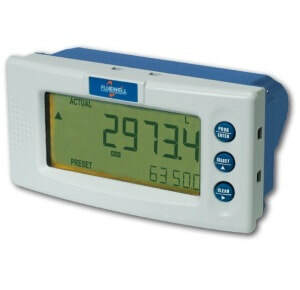 It offers the facility to set one low flow rate and one high flow rate alarm value. If desired, a delay function can be set up to allow for an incorrect flow rate for a certain period of time. Programming can be done by your own crew with the exact same, plain and sensible menu-driven structure like the F-Series, saving cost and irritation. Know one, know them all! The functionality coverage of the D-Series is impressive: Within the product overview you can get flow computers, process controllers, indicators, totalizers, batch controllers, transmitters and monitoring systems for flow, level, pressure and temperature measurement.